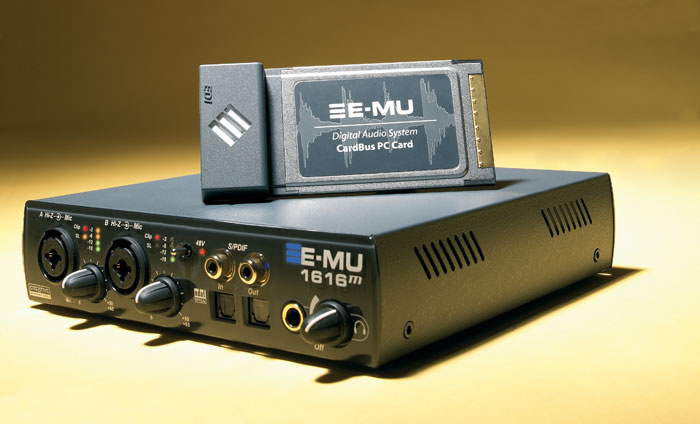 Emu are no strangers to the world of PCMCIA soundcards; way back in 1997 they released the Emu 8710 with 16-bit/44.1kHz sampling and a 2MB General MIDI Wavetable synthesizer when we were all still running Windows 95. However, their new 1616 laptop series is somewhat more ambitious, offering the same high-quality 24-bit/192kHz converters, low-jitter clock, and DSP effects that are found in their very popular PCI soundcard range, along with a versatile complement of I/O that's a slightly cut-down version of the 1820 series. Like the 1820 series, there's a basic 1616 model and a 1616M with higher-quality 'mastering' converters identical to those used in Digidesign's flagship Pro Tools HD192 interface; the 1616 manages a very good 110dBA dynamic range, while the 1616M hikes this to an excellent 120dBA for an extra £50. However, both models have an identical low-jitter clock specification and are otherwise very similar in most respects. Like the 1820M, the 1616M is a two-part device consisting of an interface card and external breakout box, connected via a proprietary digital cable terminated in CAT 5 (LAN) connectors. If you don't need the rest of the I/O, you can use the 02 Cardbus Card without the breakout box for DSP effects and a single line/headphone output, which makes a very portable setup when you want to work on mixes. The external Microdock offers two high-quality mono mic/guitar/line inputs, two more stereo balanced analogue inputs (one with an optional RIAA turntable preamp), six balanced outputs plus an associated headphone output with level control, plus two MIDI Ins and Outs, coaxial S/PDIF in and out, and ADAT in and out, which can be switched to Toslink optical S/PDIF format. The two front-panel inputs not only offer +48 Volt phantom power and a balanced XLR socket for mic use, but also a balanced/unblanced line level input on TRS-wired jack with a high 1MΩ impedance for connecting electric guitars directly. The low-noise preamps themselves are Emu-designed (previous models used TF Pro circuity), and incorporate a new switchable analogue soft-limiting option to avoid clipping and for special effects when driven hard. All the line inputs and outputs can be software switched between 'pro' +4 and 'consumer' -10 levels. The third new feature is support for 88.2 and 176.4 kHz sample rates, which 1820, 1212 and 0404 users have been requesting for ages. Emu have hinted that these might be added to the other models in a future update, but this hasn't happened to date. Compared with the 1820 models you lose a pair of analogue inputs and outputs, the Firewire port and extra S/PDIF optical out, and the sync options (word clock in and out, SMPTE in and out, and MTC out). However, the high-impedance guitar inputs, soft limiting, and extra sample-rate options may prove more attractive to many musicians, and the Microdock still manages to cram 16 inputs and outputs into its compact case. The 02 Cardbus card is very similar in size to Echo's popular Indigo cards, so that it only protrudes from your laptop by 1.25 inches, and it comes with a robust little faux leather case to protect it when not in use. The cable that connects it to the Microdock is much shorter than that of Emu's 1820 models at just one metre, but I think most laptop owners will find this a handier length. The Microdock itself is slightly smaller than the Audiodock at 7.25 inches wide by 7.75 deep and 1.63 high, but has a similar styling with grey metal casework and transparent moulded front panel. When you switch it on the Emu 'E' logo is very fetchingly illuminated in blue, and the overall effect is extremely smart. In the absence of a PCI backplate, the coaxial S/PDIF and ADAT I/O appear on the Microdock front panel, while the two MIDI Ins and Outs have been moved to a short breakout cable terminated by flying five-pin DIN sockets. The front-panel sample rate, MIDI activity, and clock source indicators have also disappeared, but the metering is more comprehensive than that of the 1820M, with -18, -12, -6 and -3 dB LEDs plus Clip and SL (Soft Limit) indicators. 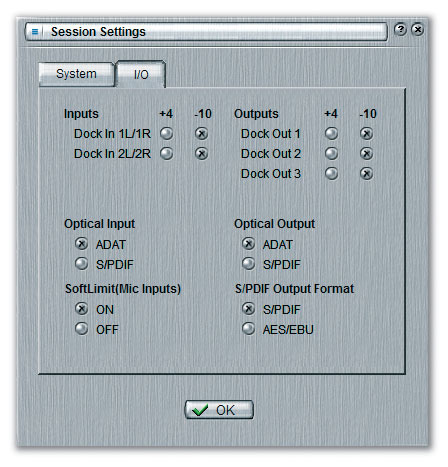 This latter option starts to operate when the input level reaches -6dBFS, and has no effect on lower-level signals. There's an additional +48 Volt socket for the supplied universal DC line-lump PSU that operates from 100 to 240 Volts AC, and there's a power switch for this on the rotary headphone level control. However, apart from these changes the remaining sockets and controls are largely similar to the Audiodock of the 1820 series. Sample rates: 44.1, 48, 88.2, 96k, 176.4 and 192 kHz from internal clock. Mic/guitar/line Inputs: two, balanced XLR with switchable global +48 Volt phantom power and 0 to +65 dB gain range, balanced/unbalanced TRS quarter-inch jack line instrument with -15 to +50 dB gain and 1MΩ input impedance, plus switchable Soft Limit option. Turntable input: twin phono, 47kΩ/220pF input impedance, nominal 15mV RMS sensitivity. 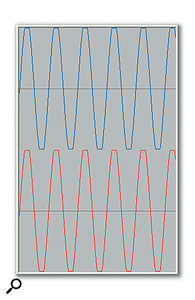 Analogue inputs: four, balanced/unbalanced line-level TRS jack at -10dBV or +4dBu sensitivity. Analogue outputs: six, balanced/unbalanced TRS quarter-inch jack at -10dBV or+4dBu level, duplicated on three stereo 3.5mm jacks, plus card headphone output and Microdock headphone output with level control. Digital I/O: S/PDIF in and out up to 24-bit/192kHz on phono coaxial, ADAT optical up to 24-bit/192kHz (switchable to S/PDIF format if required), two MIDI Ins and Outs. DSP Core effects: 1-Band Parametric, 1-Band Shelf, 3-Band EQ, 4-Band EQ, Auto-Wah, Chorus, Compressor, Distortion, Flanger, Frequency Shifter, Leveling Amp, Lite Reverb, Mono Delay (100, 250, 500, 750, 1500 and 3000), Phase Shifter, Rotary Speaker Simulator, Stereo Delay (100, 250, 500, 750 and 1500), Stereo Reverb, Vocal Morpher. Converters: AKM AK5394 ADC and CS4398 Cirrus Logic DAC (1616M), PCM1840 ADC and CS4392 DAC (1616). Dynamic range: 120dBA (1616M, analogue inputs and outputs), 110dBA (1616). RMS jitter: 596 picoseconds at 44.1kHz using internal crystal, 795ps using optical input. Frequency response: 20Hz to 20kHz +0/-0.03dB. THD + noise: -105dB (0.0006%) 1kHz signal at -1dBFS. As with most modern PC audio interfaces, only two operating systems are supported: Windows 2000 SP4 and XP SP1 or later. I found the installation process extremely straightforward on Windows XP: you plug in the Emu 02 Cardbus card with your PC powered down, then turn it on, cancel the Windows New Hardware Wizard, and run the Setup file on the Software and Drive CD-ROM. During this phase you get a choice of four languages (English, French , German or Spanish), and then a choice of Full, Custom (with Patchmix DSP, Documents and Driver options) or Driver Only installations. After restarting my laptop I was up and running with no problems at all, with the Patchmix DSP icon on my Taskbar and with the new audio and MIDI driver options all appearing within my various software applications. Don't worry if you get a random array of indicators lit up when you first switch on the Microdock — these get initialised when you subsequently power up your laptop. 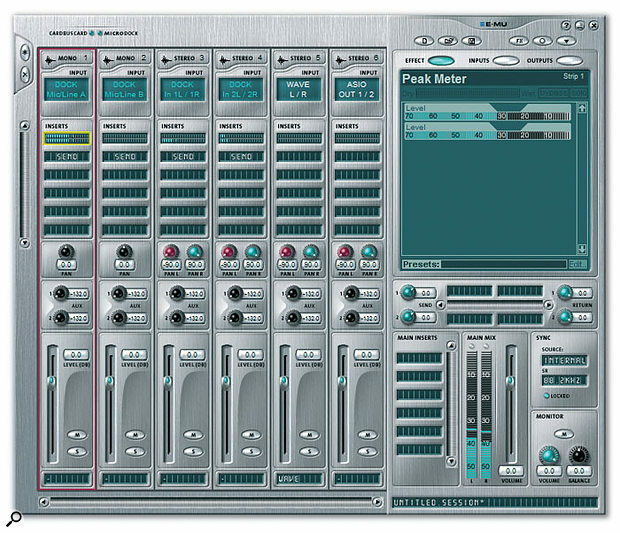 Also supplied is a comprehensive software bundle, comprising Cakewalk Sonar LE, Steinberg's Cubase LE and Wavelab Lite, Ableton Live Lite 4 For Emu, IK Multimedia's T-Racks EQ and Amplitube LE, Minnetonka Discwelder Bronze, SFX Machine LT, and Emu's own Proteus X LE, a version of their popular Emulator IV/Proteus 2000-based soft sampler with fewer user-programmable options. Apart from the Cardbus card and Microdock hardware blinkies at top left, and the 88.2kHz readout in the new Sample Rate text box, the Patchmix DSP Mixer is almost identical to that of Emu's 1820, 1212 and 0404 PCI soundcards. 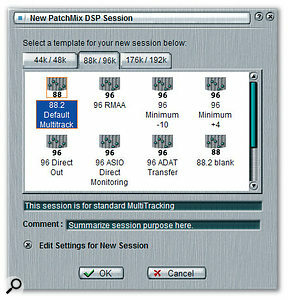 Emu's extremely flexible but initially confusing Patchmix DSP utility is almost identical to that of the PCI range, so please read my SOS June 2004 review of Emu's Emulator X for more details of its various functions, or look out for my forthcoming Emu Soundcard Workshop for further hints and tips. In essence, it offers a Main Section containing master controls and inserts, aux returns, and a 'TV screen' displaying routing and FX parameters, plus a Mixer Strip Section where you can load as many or as few channels as you need, and a floating FX Palette window to drag and drop DSP effects into the various channel or master effect 'slots'. The entire mixer, its monitoring functions, and its effects operate with zero latency, and are extremely flexible. You can save and load mixer setups as 'Sessions' for use in different circumstances, and as usual Emu provide a selection of Patchmix DSP 'Sessions' to get you started. The template pages are now labelled 44k/48k, 88k/96k and 176k/192k to reflect the new sample-rate options, and there are also new 'blank' templates for creating a new Session from scratch. This this is the first Emu interface to support 88.2 and 176.4 kHz sample rates, so the New Session dialogue pages change to 44.1/48k, 88.2/96k and 176/192k, and include various new templates. I did spot a few differences compared to the PCI version, the most noticeable being that there are now only 16 instead of 32 possible ASIO inputs and outputs for ferrying signals between Patchmix DSP and your audio application. I can't see this being limiting in practice since the 1616 only has 16 physical outputs (six analogue, eight ADAT and two S/PDIF) to which you might want to route the ASIO outputs, and it's unlikely that you'd want to send all the analogue, ADAT and S/PDIF signals simultaneously to your sequencer either. Perhaps more irritating is that the Dock Out 1 and Headphone outputs carry one and the same signal instead of being separately routable as on the 1820, so you can't for instance listen on headphones to the various individual analogue or digital outputs without affecting the main output as well. If you want to plug in two pairs of headphones (one to the 02 Card and the other to the Microdock front panel) you can balance their levels using the Patchmix DSP monitor level for the first, although this will also affect the Dock Out 1 signal level, and the front-panel rotary control for the second. However, when the Microdock is plugged in, most people will only use its headphone output, in which case the Dock Out 1 signal can be left at its full level and the headphone level adjusted separately from the front-panel control. The Taskbar icon now has a useful extra tickable 'Load FX on Startup' option that you can disable to speed up your computer boot time in favour of loading the effects only when needed. The range of DSP effects on offer is identical to those of the PCI range: see the 'Brief Specifications' box for more details. It includes the Lite Reverb and various Mono and Stereo Delay options added in the version 1.6 PCI update, and once again, you can use them either directly within Emu's mixer, or as VST plug-ins in your sequencer. The DSP effects are, alas, still unavailable at sample rates above 48kHz, and like the other models in Emu's range, the 1616M provides reduced numbers of channels at higher sample rates. The ASIO channels are reduced from 16 to eight at 88/96, and to four at 176/192 kHz. At these two top sample rates the number of physical inputs and outputs also drops to four and 10 respectively, and the S/PDIF optical I/O is disabled. Overall, the Patchmix DSP mixer is just as capable as it is on the PCI models, and the addition of a good selection of usable DSP effects to take the strain from your CPU is even more welcome for laptop owners, especially for those with less powerful processors. It will be particularly useful during recording to add, for instance, reverb to a monitor mix without all the delays and overheads associated with using software plug-ins 'live'. My customary double-blind listening tests were a challenge, since I had to run them simultaneously on a desktop and a laptop PC to hear all three interfaces (Emu 1616M, 1820M and Echo Mia) in action at the same time. However, although I could pick out the Echo Mia every time as providing a less focused and detailed sound, I simply couldn't hear any difference at all between the 1616M and 1820M. This isn't surprising considering they both contain identical converters, clocks, and most of the other circuitry apart from the input preamps, and we can safely conclude that the 1616M offers the same superb audio quality for the price as the 1820M. The Soft Limit option in the Settings menu provides a very useful way to avoid clipping distortion with high signal levels. The new mic preamps sounded very good to me, with an extended frequency response and sweet sound. I've always been a fan of analogue soft clipping, since as long as you're reasonably careful about your input levels the sound remains the same but you don't have to worry about the occasional harsh-sounding digital 'over'. Emu's version of this worked well, providing warm-sounding rounding of the waveform peaks rather than harsh clipping, although I found it was still eventually possible to drive the waveform into clipping as a special effect if you drove it hard enough. My Rightmark Audio Analyser tests gave almost exactly the same results as with the 1820M, with dynamic range of a truly excellent 117dBA at 44.1kHz and 118dBA at both 96kHz and 192kHz, low THD of 0.0005 percent, and stereo crosstalk of -118dB. There's still a tiny droop in HF frequency response, but considerably less than the 1820M at only -0.2dB at 20kHz, while at 96kHz the response is significantly extended to -1dB at 43kHz (compared with 32kHz for the 1820M), although like the 1820M it remains at -1dB at 30kHz when using 192kHz sample rate. Here is a high-level input signal before the 1616M's Soft Limit option is activated. On my 1.4GHz Centrino laptop I managed to run the ASIO drivers down to 4ms with no glitching, although the 2ms setting was beyond it, and while the Play Ahead setting for NI's Pro 53 was a typical 45ms for MME, the Direct Sound drivers were surprisingly good, managing the minimum 10ms setting. Evert van der Poll's MIDItest 2.10 utility proved that the MME MIDI driver performance was well up to scratch as well, with message latency of 1.05ms, jitter of 0.22ms, and maximum jitter of 0.82ms. This is roughly on a par with every other PCI interface I've tested over the years, and considerably better than any USB or Firewire interface, most of which exhibit latencies of between four and 10 milliseconds on this test, jitter of half to one millisecond, and maximum jitter from 4ms upwards. Some potential customers will be disappointed that Emu still haven't come up with the promised multi-channel WDM drivers, although they aren't alone in this (Echo haven't yet provided them for their Audiofire range, for instance) and most applications now support the high-performance multi-channel ASIO drivers anyway. There is also still no GSIF driver support, although you can run Gigastudio 3 via a Rewire connection instead, as I've been doing with my 1820M. 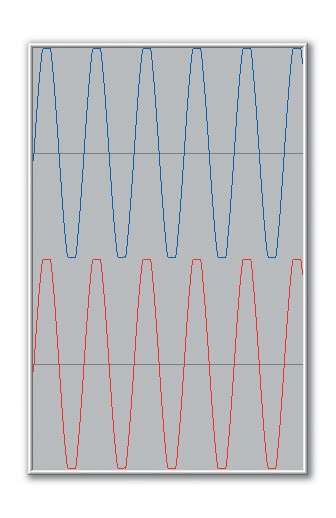 Here is a high-level input signal after the Soft Limit option is activated. The choice of audio interface to partner your laptop used to be fairly easy. If you wanted a basic stereo device, there were plenty of USB 1.1 interfaces, or you could choose one of Echo's PCMCIA Indigo series, while if you wanted more I/O, most options were Firewire, and not every laptop had a suitable port. The beauty of a Cardbus option is that it's so small and convenient, and by making the 1616M card work as a stand-alone product, Emu will attract those who want a portable interface that can be 'expanded' when required. Indeed, Emu have already been asked if they would sell the 02 card as a stand-alone product, and this is now a strong possibility, although I should point out that it's only compatible with the Microdock, and not the 1820M's Audiodock. Once you plug in the Microdock you have a powerful and versatile interface, and although you can buy more analogue inputs for around £350 now that products like M Audio's Firewire 1814 and Edirol's FA101 have dropped to similar street prices, each one has a somewhat different specification. Emu's 1616M scores on its excellent audio quality, the soft limiting, turntable preamp and DSP effects. While the latter are closer in quality to a mid-range rack effect unit than to the Powercore or UAD1 cards, they are nevertheless extremely useful, particularly so for laptop users whose CPUs would benefit from a helping hand. The only comparable PCMCIA cards I can think of are Digigram's VXpocket range, which is considerably more expensive yet provides fewer features, and RME's popular but again rather more upmarket Cardbus PCMCIA and Multiface I/O box, which provides lots more of everything but costs around £600. Even 1820M owners like me will be envious of the 1616M's high-impedance guitar inputs and soft-limiting options, the more refined preamp level meters, and support for 88.2/176.4 kHz sample rates. Losing a pair of analogue inputs and outputs isn't the end of the world, and I suspect far fewer people will bemoan the loss of the word clock, SMPTE and MIDI Time Code features. Indeed, the street price of the 1820M is now only about £25 more than the 1616M, and with the addition of a PCMCIA-to-PCI adaptor you could use it with a desktop PC as well as your laptop, making it even more versatile. Emu have already taken this on board and are testing suitable adaptors with the intention of selling the best one from their web site. They are also planning to release Emulator X and Proteus X upgrades for those who want more powerful soft samplers than the bundled Proteus X LE, and those who already have these will eventually be able to use them with the 1616 series as well. With two mono mic/guitar inputs, two stereo line inputs, one with a RIAA-equalised turntable preamp option, three pairs of stereo analogue outputs, headphone out, two MIDI Ins and Outs, S/PDIF and ADAT in and out, all for £350, Emu's 1616M is both versatile and excellent value for money. I think they've got another winner on their hands! Provides the same excellent audio quality as the 1820M. 02 Cardbus Card can be used with or without Microdock I/O box. Front-panel mic/line inputs have handy Soft Limit option and high impedance for guitars. Stereo turntable preamp and useful range of DSP effects. 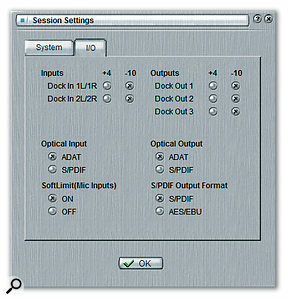 The first Emu interface that supports 88.2kHz and 174.6kHz sample rates. Headphone routing is less versatile than that of the 1820M. Still no multi-channel WDM drivers or GSIF support. Still no DSP effects options above 48kHz. Emu's 1616M provides a unique set of features including analogue limiting, a turntable preamp and superb audio quality for a very reasonable price, and its DSP effects are the icing on the cake for hard-pressed PC laptop and even desktop PC owners, with a suitable PCMCIA-to-PCI adaptor. 1616M £350; 1616 £300. Prices include VAT.